A new athletics team event, headlined by Usain Bolt, could "revolutionise" the sport, according to World Athletics chief Lord Sebastian Coe. The inaugural Nitro Athletics events take place in Melbourne next month, with six teams of 24 athletes taking part in non-traditional events such as middle-distance and hurdles relays. Nine-time Olympic champion Bolt, 30, will captain an 'all-stars' team. "We need brave, bold ideas that engage fans in events," said Coe. "Athletics is a global sport with a global following, but we need events that bring back the fun, the kids and the crowds and... add a different dimension to the record-setting events like the world championships. "Nitro Athletics is a great example of what can be done and what needs to be done to revolutionise how we present our sport and how our fans connect with the sport and the athletes." Bolt and his team-mates will compete against squads from Australia, China, Japan, New Zealand and England - the latter captained by 2008 Olympic 400m champion Christine Ohuruogu. 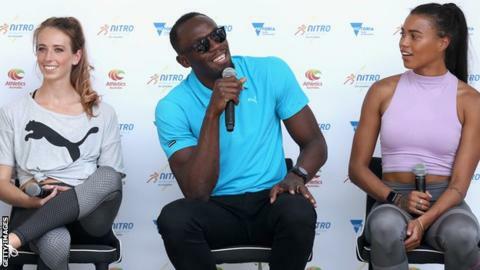 The Nitro series will take place at Melbourne's Lakeside Stadium on 4, 9 and 11 February, and will build up to the World Championships in London in August, which is expected to be Bolt's final major competition. Read more on Usain Bolt: What is the world's fastest man really like?